Picking out your very first sports smartwatch can be incredibly tough, especially when there are so many different sports smartwatches in the market right now. If you are shopping around for your very first wearable technology and is feeling overwhelmed by the wealth of information, we at HealthLoco have done the research for you. How often do you come across a sports smartwatch with a replaceable band? 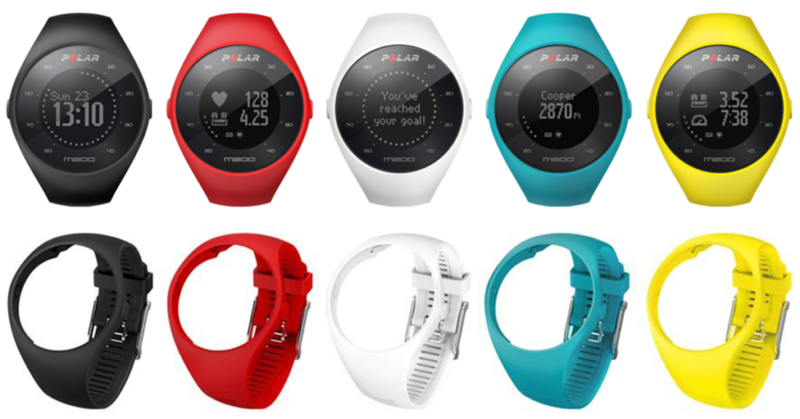 The Polar M200 has a removable band that comes in 5 different colours! This allows you to customise your very own sports smartwatch. More often than not, the design of some smartwatches might jut out from your attire. With a customisable band at about $25 each, it is much easier to match your sports smartwatch with the colour of your outfit. The fact that the wristband is removable also makes it easier for cleaning, which is a major plus point. However, as compared to other smartwatches, the Polar M200 has a monochrome display. This can be a good and bad thing, depending on your wardrobe style. Those with a largely monochrome fashion style would definitely appreciate the simple, no-frills display of their M200. The watch face features a black bezel, while the centre is a circular LCD display. The entire watch face is black, and the inverted LCD certainly adds to the sleek appearance. Polar M200 is also incredibly lightweight, weighing at just 40g (3 times lighter than an iPhone 7). The Polar M200 is waterproof up to 30 meters. This means that you do not have to worry about the watch when you jog during rainy days, nor do you have to remove your watch when you shower. You can literally let the watch be a part of your wrist, as long as you stay out from the swimming pools and the deep sea. The Polar M200 also has a built-in GPS Function and a heart rate monitor at the back which allows you to track your distance, route, and heart rate. This means that you can leave your phone at home when you are out on your run. The watch is good at tracking all the data, but it only displays the basic information on your watch. It is only when you connect to the Polar Flow software that you will find just how powerful the M200 is. You can view all your past workouts and see a myriad of information about them – from your running path marked out on Google map, to fluctuations in your heart rate, to your speed at various laps. The app will also use all the data to determine your progress of your workouts, highlighting the areas where you need improvements. The heart rate monitor of Polar’s smartwatches is well-known to be almost perfect. Unlike most fitness tracker on the market that uses an older heart rate monitoring technology, the Polar M200 employs optical trackers, which measure how the light is scattered by your blood flow. This means that even if the sensor is moving around, it will still be able to measure your heart rate pretty accurately. Polar M200 runs for 24 hours for activity tracking and has a 6 days battery life. It makes it a lot more convenient as you will not have to charge it on a daily basis. It is a lot easier and hassle-free for people who constantly forgets to charge their devices on a daily basis. 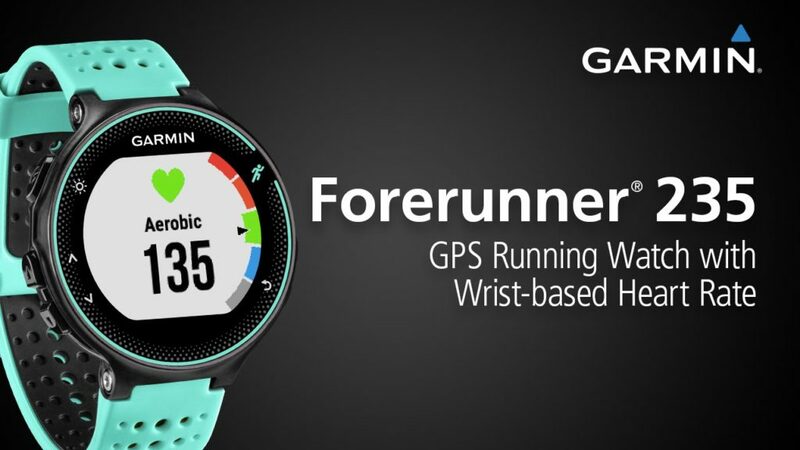 The Garmin Forerunner 235 has a 1.23-inch colour LCD screen and displays data in 215 x 180 pixel resolution. Like the Polar M200, the Forerunner 235 also allows you to purchase additional silicone colour straps for you to change according to your mood and outfit. It is also a relatively lightweight smartwatch at just 42.5g. The screen is always on, and the backlight is enabled so that it is bright enough to read even during the day. 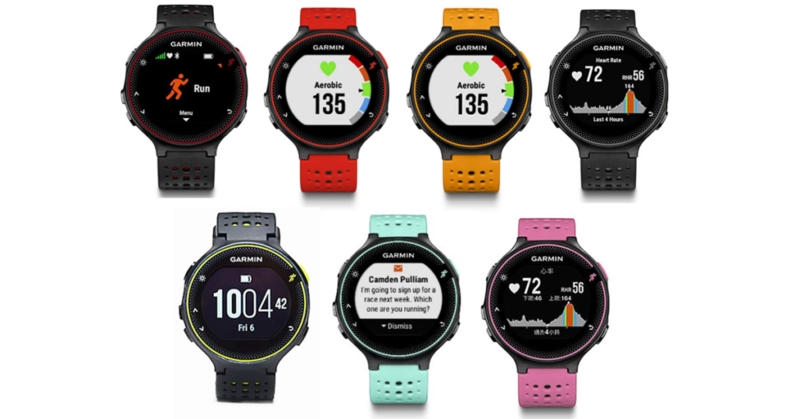 With the Forerunner 235, you get pace, distance, time and calories (of course) as well as average heart rate, max heart rate, cadence and Training Effect (TE) which rates how effective the session was for you out of five. You can access most of these metrics mid-run and you can tap the up or down button to control the metrics shown on screen on the Garmin Forerunner sports smartwatch. 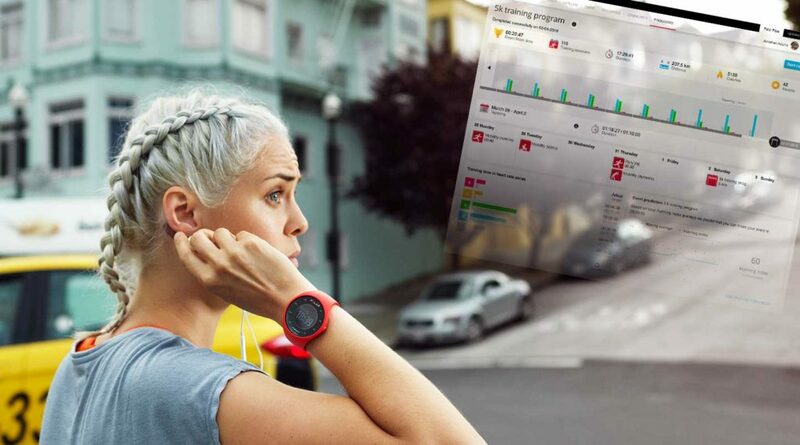 Another feature worth highlighting is the Garmin Forerunner ability to load workouts synced from the Garmin Connect web application. In the application, you can customise your workouts, set your desired warm up time, workout time, distance or intensity, and warm down period, and have it sent to the watch. 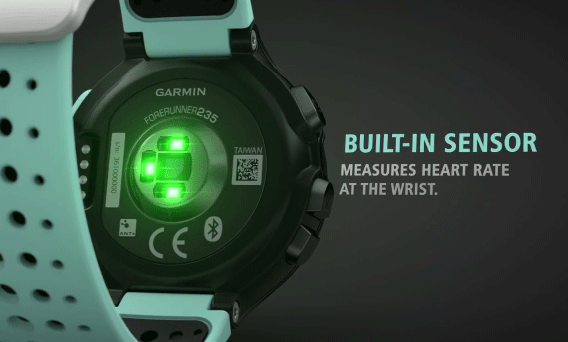 Garmin uses its own in-house technology called Elevate for its heart-rate sensor. The method is similar to the Polar M200: three green LED lights are used to light up the capillaries while the sensor measures how fast your blood flows past. However, according to Cnet.com, the sensor is inconsistent and lagged behind the chest strap, which is often thought to be the most accurate for measuring heart rate. The Forerunner 235 can last up to 11 hours with an active GPS signal, and up to 9 days when in watch mode with notifications and heart rate enabled. The TomTom Spark looks very much like a chunky piece of black plastic with an LCD monochrome screen. There is also a backlight which would be obscurely summoned by placing your hand over the display screen. It has the look of a classy smartwatch which can be paired easily with any casual wear. The TomTom Spark strap features a loop with two poppers in the band that secures the watch on to your wrist. The bands are also changeable which makes customization easy to suit your preferred style and your fashion. Changeable bands will also allow cleaning to be easier after all the sweating from your workout. You will also be able to select the colour of the strap to fit your workout gear. The bands come in different sizes, ensuring the perfect fit for your wrists. However, we found that the watch can be a bit too bulky on smaller wrists. What we liked best about this watch is its ability to play and store up to 500 music, which can be played with a wireless headset. This is great for people who want to avoid the hassle of bringing their phones or music devices out on their workout. TomTom Spark has a built-in heart monitoring system to monitor and track your heart rate. It also has GPS tracking to track distance and time. 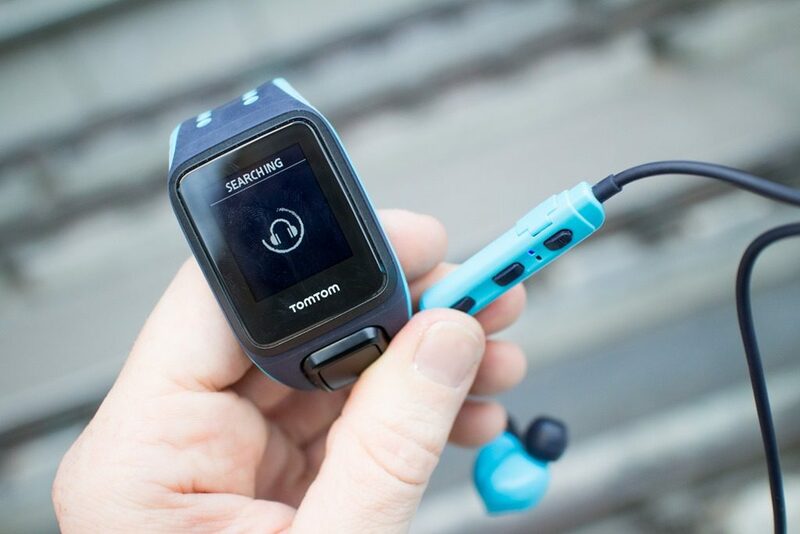 The TomTom Spark will track running and cycling, as well as swimming, treadmill, gym workouts, indoor cycling (with a cadence sensor) and open training. There is also a number of training options that can be accessible from the watch itself. You can start an interval session, choose a pace to run, and even a heart rate zone – if you are running outside these zones, the watch will alert you. You will also have the ability to challenge yourself and race against any previous run. Select to race against it from the watch and the watch will let you know if you are far behind or ahead of yourself. The only downside of TomTom Spark is that it dumps you right back onto the home screen after your run, without showing you any summary or stats. Together with the TomTom Sports app, you will be able to track all your sports activities, data, progress, personal insight, and see all your activities. With GPS tracking, you will only get 5 hours of battery life, which is relatively short. You would get a week’s of battery life only if you turn off the GPS tracking. HealthLoco Reviews: The best inexpensive smartwatch in the market right now? Polar M200 comes out top amongst the three, in terms of its design and functionality. The robust heart rate monitoring technology and the powerful Polar Flow app are all you need in a fitness tracker. The changeable band also makes cleaning and styling easy, and the long battery life is super convenient for people who do not have the habit of charging their electronic devices.